Welcome to BookSeriesInOrder.com. My name is Graeme, and I run "BSIO" as I call it. The goal of this website is simple dudes: to list the series of every book in order. We provide the book series in order by author(ie: Lee Child), and then in order of the character or series(ie: .Jack Reacher) Where applicable, we provide you with both the publication order of the books written, as well as the chronological order of the books. Of course - there are a lot of authors and a lot of books out there so this isn't going to happen overnight! But we're adding new ones every day. We also have a suggestion box on the right sidebar. If you're an author and want listed here, or one of your favourite authors isn't on the site then please let us know and we'll prioritize them in regard to adding them. I've also added beside each book a link to their Hardcover, Paperback and Kindle version. These are the best prices listed for the book - which is 99% of the time at Amazon. So if you're looking to buy them head on over via the links. Alright, that's about it for me just now. I've got a ton of AWESOME stuff planned for this website over the coming months, so be sure to bookmark us and stick around. We tend to add the order of books series by request or popularity. For example if you search in the top right and the author or character you searched for don't have a series of books listed on here? Don't worry - we're taking note of that and will get them up ASAP. At this time we're currently only focusing on listing the Books in Order - reviews, blogs, contests and other fine things will have to wait. But we're hoping once we have over 1000 articles listed to expand and start dealing with author interviews and reviews of books. Thank you very much for visiting Book Series In Order. Please tell your friends. 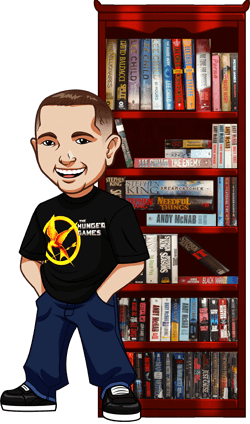 I run a bi-weekly newsletter with 6-8 book recommendations. For more details on that click here.